Green energy, or green power as it’s also known, typically refers to electricity generated by the sun, wind, and water. 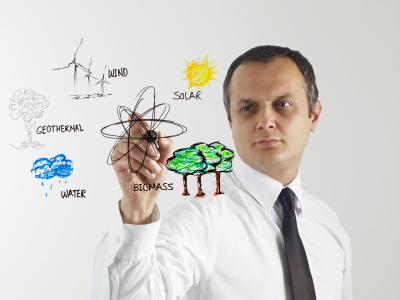 Although the exact definition varies depending on a variety of factors, it generally includes solar, biomass (including landfill gas, waste-to-energy, and other waste products), wind, hydroelectric, and geothermal. The most well known are solar and wind. >What Does it Mean When a Company Calls Itself Green? “Going green” can translate into many different types of sustainable initiatives focused on corporate and social responsibility. 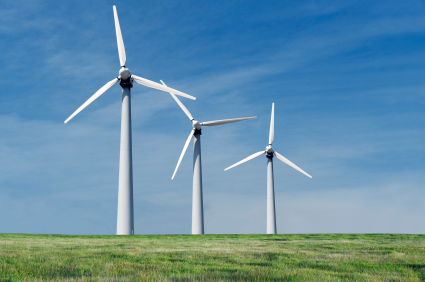 Many businesses and organizations are purchasing Renewable Energy Certificates (RECs), which helps to encourage the development of facilities that generate energy from the sun, wind, and other renewable sources. 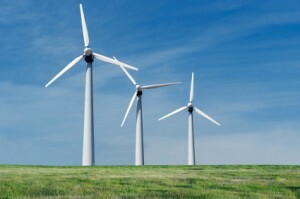 Renewable energy-producing plants, like solar and wind farms, produce and deliver electricity to the grid. 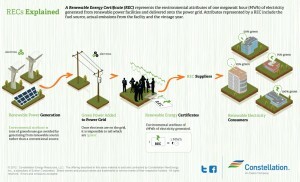 In exchange, businesses receive a REC for each megawatt-hour produced. See below for more details about how RECs work! 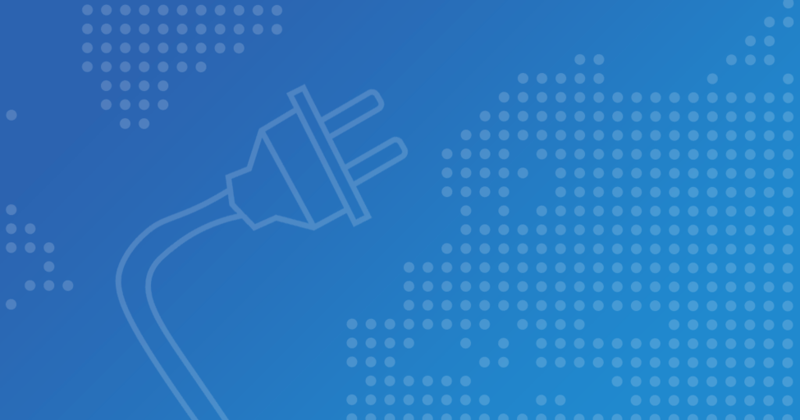 A Renewable Energy Certificate represents the environmental attributes of one megawatt hour (MWh) of electricity generated from renewable power facilities and delivered onto the power grid. To see how this really works, click on the icon on the above left to view our infographic explaining the concept. 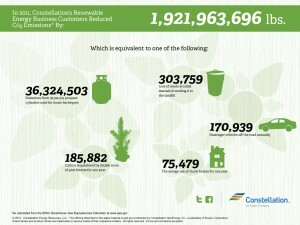 In 2011, our renewable energy business customers reduce their CO2 emissions by over 1 billion lbs. As released on our other blog, click on the icon above to see the overall environmental impact. 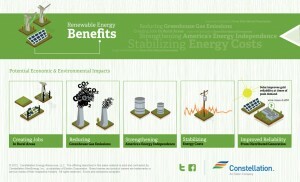 Going “green” includes a lot more than environmental responsibility. 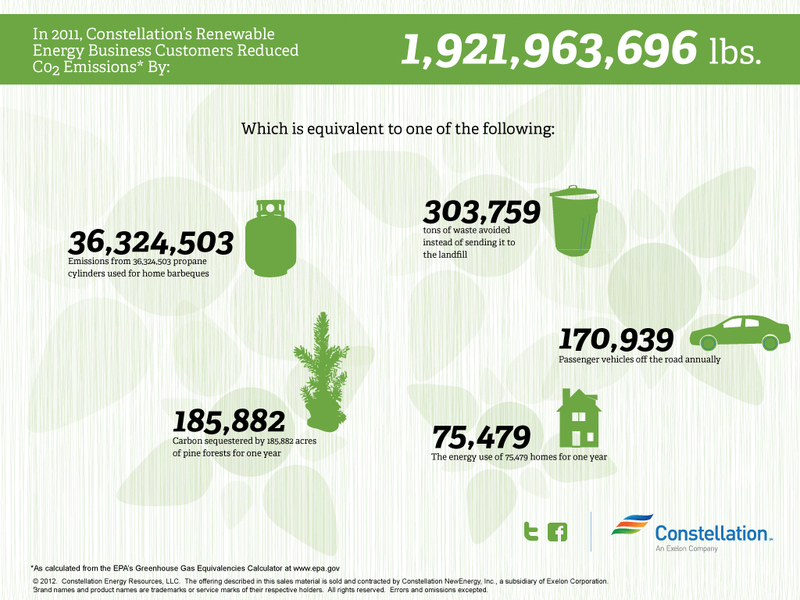 We created an infographic that highlights all the other ways that choosing renewable energy can potentially impact our economy and environment. Click on the above left to view the infographic. Homeowners in Connecticut (served by CLP and UIC), Illinois (served by ComEd), Maryland (served by BGE, DPL, PE, Pepco), and Pennsylvania (served by MetEd, PenElec, PennPower, PPL, West Penn Power) that are interested in learning about the options that Constellation provides to go 100% green at home, should go here.